The plague that wiped out over a third of Europe's population in the 14th century came from a bacteria known as Yersinia pestis. Now we've sequenced its genome...and it's weirdly, almost worryingly identical to its modern descendants. Bubonic plague is still around, but these days it's exceedingly rare and quite treatable. It's hard to believe that the Y. pestis strains we see today are even related to those that ravaged Europe in the 1300s - indeed, some researchers have voiced doubts that Y. pestis even is the Black Death pathogen at all because its behavior and virulence are so different. Now, thanks to a mass grave dug in London at the height of the plague, we know for sure that it really was Y. pestis that was responsible. Researchers at the University of Tübingen were able to recover pieces of the bacterium's DNA from the teeth of the victims found in the grave. 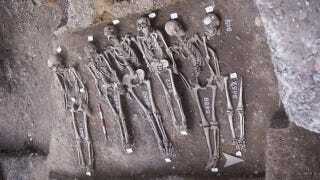 From this, the researchers have pieced together a genome for the Black Death, making it the first pathogen more than a century old to be sequenced. So then, we know Y. pestis really was the Black Death. The only problem is that this is the sort of answer that just raises more questions. Researcher Johannes Krause explains that, as far as DNA is concerned, there's practically nothing to differentiate the Black Death from modern Y. pestis strains. The results were obviously massively different, but it doesn't appear that some deadly mutation happened to make the ancient bacterium into the ultimate killer. Thankfully, this doesn't mean the modern Y. pestis strains are on the verge of turning back into the Black Death. Rather, the causes of the Black Death must be a little more complicated than just this one bacteria. It's possible that fourteenth century Europeans' complete lack of previous exposure to the pathogen made them so totally vulnerable, and the human race now has something of a general immunity to it. Another possibility is that the ancient Y. pestis managed to team up with another pathogen to create a truly lethal combination, a phenomenon known as a syndemic. The researchers can't be sure, but they have a plan to find the answers - keep digging through medieval graves and looking for pieces of DNA, reminding us once again that there is pretty much no difference between serious science and the setup for a bad horror movie. Via Nature. Image by the Museum of London Archaeology.